#3 - How to Improve your Online Presence with €100? All technology is changing our lives in so many different ways, but it has not yet penetrated the most fun part of our nights. Why has technology not yet caught up with nightlife? Why is the industry still marked and defined by its many inefficiencies? Why is there no optimized marketing tool for nightlife businesses? All successful businesses exist because of the problems that they solve. To solve a problem, you must understand the problem. Today we live in the information age where data has become a vital tool in the way business is done. Even for those whose business is managing clubs, bars, restaurants or hotel bars, the use of data has become a vital element in determining how well their business is faring, or what needs to be changed to improve to sustain the business. It is Friday night, and you have an event coming up. Your marketing team invited the people in your community on Facebook and you know some of them will see the posts. Of course, you want to reach other like-minded local people. What if there was an optimized marketing tool for nightlife business to help you with that? Business owners and hospitality staff are always busy. Perhaps a little too busy? How can we effectively promote our events above the competition? How can we create meaningful relationships with our customers? How can we improve attendance, bar sales and reputation? Digital marketing nightlife - collect data from customers and use the data to your advantage. By reviewing the problems or issues faced you can take necessary measures to prevent or resolve them before they affect the business negatively in nights to come. It helps you to smart-connect with your audience and come up with digital marketing strategies. Since people want experiences, and venues offer experiences, the ideal solution enables and improves mutual communication about what experiences are offered, and what experiences are desired. The digital marketing nightlife tool of Nocto focuses on creating an understanding of 3 elements: audience behaviours, audience demographics and audience desires. All the information that can be collected by Nocto’s business platform provides venues with the ability to understand & connect with their audience. A nightlife marketing strategy is needed to attract people to your venue. Marketing is one of those places you are likely throwing money in the wrong places. You have a general idea which channels to market on - social media, in-venue specials, text messages. But you are not sure which actions are actually driving people through the door while simultaneously earning you more spending per guest. Before defining your nightlife marketing strategy, you should track marketing efforts to see what drives traffic and results. One of the most important nightlife marketing strategies is word-of-mouth marketing. People spreading the word about your venue is more effective than other types of marketing. Whether compared to traditional advertising, media mentions, or promotional events, word-of-mouth promotion is more useful in attracting new customers. Turning people into ambassadors is next level marketing. Many businesses today rely very much on data for their marketing promotions, and there is no reason why your venue should not do so. Having such data provides you with a better picture of what the customers base is and what their preferences are. Now your venue can tap into those elements and make your business more appealing to them. Our nightlife marketing concept can provide you with a lot of valuable data. 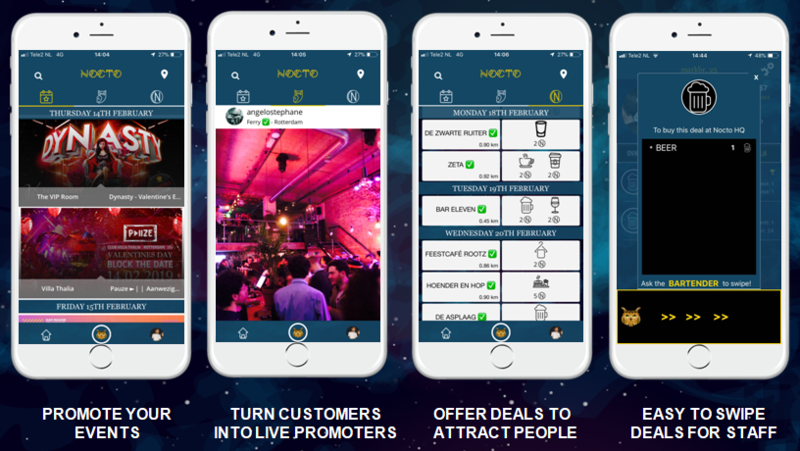 With Nocto’s marketing tool for nightlife businesses, which is specifically designed for bars, clubs, restaurants and hotels, you are able to promote your venue in an innovative and effective way. Every business today should take advantage of the availability of data which will help their business achieve growth in the long run. Our nightlife marketing tool collects all needed data through our nightlife social media app. Besides collecting data, it is a tool to promote your venue, your events, you can turn your customers into ambassadors and be able to attract more people on specific days and times by offering deals. Technology is improving many aspects of our life and Nocto aims to reduce the inefficiencies in nightlife. Nocto’s Business Platform is a powerful and easy to use marketing tool that connects you with your audience, helps you understand their preferences and improve your customers' satisfaction. Not only can you attract more customers by offering deals, but you can also form meaningful relationships with them. If you are interested and want to learn more about Nocto’s features, please contacted m.brouwers@noctoapp.com for more detailed information. You can sign up your venue here!